What is the letter C in hieroglyphics? There are two ancient Egyptian hieroglyphic symbols for the letter C. Each one represents a different sound. 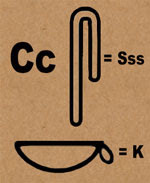 The first hieroglyphic symbol is a cup and it's pronounced K as in coffee. The second symbol is a cloth and it's pronounced Sss as in soft. 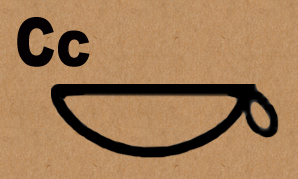 This basket or cup symbol for the Letter C is for the hard C.
It's pronounced "k" as in CUP. 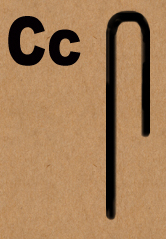 The C symbol looks like a cup. The word cup also starts with C.
Think of C for CUP to remember its shape. The Folded Cloth = "Sss"
is pronounced "ss" as in SOFT. Although there's no C in soft, the "SS" sound is the same and the folded cloth looks soft. To remember the C symbol, think S for SOFT.